What would the world be like if nobody could lie — not even a harmless little white lie? It would probably be like the world envisioned by British comic actor Ricky Gervais in The Invention of Lying, where brutal honesty is the order of the day, until Gervais’ hapless character suddenly develops the ability to lie, or in his words, “I said something… thatwasn’t!” We are treated to an image of neurons in his brain firing in new ways at that pivotal evolutionary moment. That image seems appropriate, given that scientists have been looking into using functional magnetic resonance imaging (fMRI) to achieve a kind of “brain fingerprinting” as a means of lie detection. 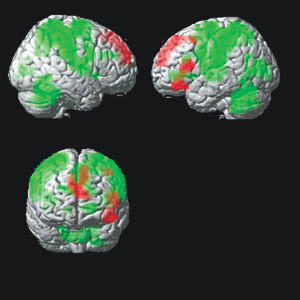 In fMRI, when certain parts of the brain are engaged during a specific cognitive activity, those areas light up in the brain scan — and if a person happens to be “dissembling,” it should be possible to tell that they are lying just by looking at the scan. Traditional polygraph tests, which measure physical responses such as respiration, heart rate, pulse, and electrical skin conductance to determine if a subject is lying, are notoriously unreliable, and scientists are still looking for the equivalent of Wonder Woman’s magical lasso of truth. Brain fingerprinting seems to offer something closer to an objective analysis of whether or not not someone is lying. How can a brain scan lie, after all? Well, maybe the scan doesn’t lie, but how we interpret those images is prone to human error, particularly since we don’t fully understand how this complicated organ called the brain actually works. Chief among the naysayers of this new “mind reading” technology is Melissa Littlefield, who argues that the technique is based on fundamentally wrong assumptions, most notably “truth” is the baseline, the natural state of being, and lying is adding “a story on top of the truth.” That might be true in Gervais-Land, but the real world is far more complicated. An fMRI scan might reveal a lie if the person knew he or she was lying — if it were a conscious decision. But “some people don’t actually know that they’re lying, or have a told a lie for so long that it becomes their subjective interpretation of reality,” Littlefield explains. And just as with the polygraph test, it’s possible to cheat and beat the machine: just clench your teeth or move your head slightly. FMRI requires the subject to hold perfectly still to get a useable image.